Jacob P. Leese was well-known in Alta (upper) California. A native of Ohio, like many young men of his time Leese had left home at an early age. As hunter, trapper, trader and guide on the Santa Fe Trail he had been successful enough by the age of 25 to establish a mercantile and marine supply business with a partner in Monterey. Leese’s new home, completed by a crew hired from ships moored in the bay, was the second residence in the nascent village – Capt. Wm. Richardson, known as the founder of San Francisco and later of Sausalito, had erected a tent to house his wife and children a year before. Leese’s home and store was the first frame structure in what would one day be billed as “everybody’s favorite city.” As soon as it was completed he, in his own words, “invited the whole countryside to a glorious Fourth of July party at which the guests ate, danced and drank for three days while both the Mexican national emblem and the Stars and Stripes floated overhead.” That occasion, in the summer of 1837, is assumed to be the first appearance of Old Glory in California. Notable among the great prospects Leese saw was General Mariano Vallejo’s sister Rosalia, whom he courted and wed in a remarkably short time. In 1838, their daughter Rosalie was the first American child born on the San Francisco peninsula. 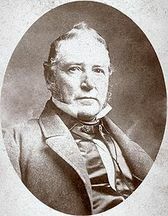 Leese became socially and politically active in both Yerba Buena and throughout the district of Sonoma, where in 1841 he claimed about 18,000 acres around Carneros Valley. He soon commissioned the construction of a grand adobe home in Sonoma across the plaza from that of General Vallejo. His fortunes multiplied, primarily through his dealings in land. He subsequently purchased or traded several other parcels of land in northern California and the Monterey area, including the lands that became Salinas, California, where he is listed among the city’s founding fathers. The year after he set up his cattle business on the ranchos here, Leese was caught up in events directed at his well-known brothers-in-law. Most notably, Leese served as interpreter/translator during the Bear Flag Rebellion of June 14, 1846, the first overt move toward making California a part of the United States. We’ve all heard of the rebellion, but the ease by which the rebels took over is rarely noted. There was only token resistance. Well before they arrived, General Vallejo had heard the approach of the thirty-three rowdy Americans who stormed Vallejo’s Sonoma headquarters in the wee hours of the morning June 14, 1846. He donned a full-dress uniform and greeted them at the door, invited their leaders in, and offered wine and brandy to the ragtag group of militants. As discussions began, Vallejo suggested that Jacob Leese might be useful “to help draw up any formal papers that would require approval and signatures.” A few hours later the rebels claimed victory and raised a hastily constructed Bear Flag over the villa, declaring California a free and independent republic. General Vallejo and other officials were taken prisoner. Leese was asked to accompany them to act as interpreter, but by the time of their arrival at the fort he too had been made a prisoner. News of the declaration of the Mexican-American War reinforced the rebels’ claims. On July 7, 1846, Commodore John Sloat planted the American flag in Monterey. Seven weeks later, on August 2, General Vallejo, ill with malaria, was released. Jacob Leese and others were held until August 8. Leese went back to buying and trading land and in the following years became, despite his questionable spelling, adviser, accountant, business representative, and counselor to most of the old-line families as well as many recently arrived ranchers in Sonoma, Napa and Mendocino counties. By 1851, Leese, like Salvador Vallejo, apparently wearied of long distance ranching. He sold both of the local ranchos, and presumably the cattle on them, to Capt. Archibald Alexander Ritchie for $14,000. South Lake County was still essentially owned by one man, just a different man.